The Birdist: Interview with Waterfowl Breeder Rosemary Miner aka Hey, Is That Your Smew? 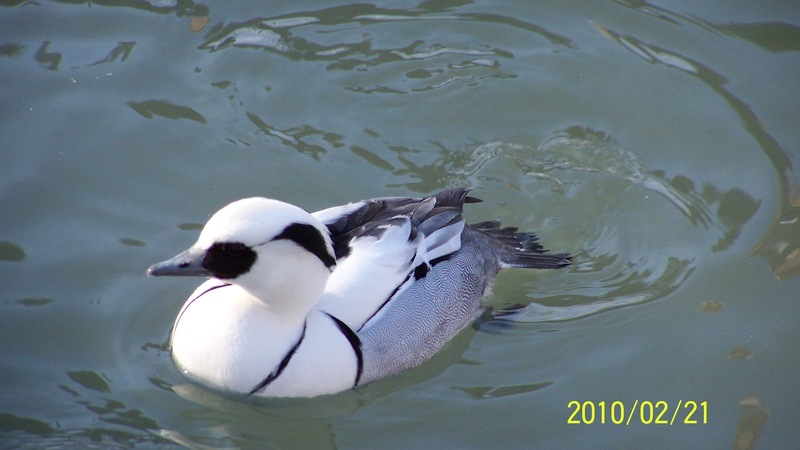 Interview with Waterfowl Breeder Rosemary Miner aka Hey, Is That Your Smew? Escaped waterfowl might be an even more difficult ID challenge for birders than cage birds. Strong fliers and long-distance migrants, it can be easy to imagine one being blown off course over an ocean onto a far shore. Indeed, many types of waterfowl have strong patterns of vagrancy to both U.S. coasts: including geese (barnacle, pink-footed, emperor) and ducks (Eurasian wigeon, tufted). At the same time, raising exotic wildfowl is a common practice. I got in touch with Rosemary Miner from the Gooseneck Hill Waterfowl Sanctuary in upstate NY - home of the the two largest covered aviaries in the world - and asked her about some of the issues she deals with raising waterfowl. I found Rosemary through her website, which I noticed lists 'Smew' among the ducks she keeps at her sanctuary. This caught my eye because in December a young smew spent several days in Whitby Harbor, Ontario, not too far (as the smew flies) from the Gooseneck Hill Sanctuary in Deleven, NY. I asked Rosemary several questions about this bird, not because I wanted to be a spoiler for anyone's bird, but because I'm not sure how much direct inquiry of breeders goes on when a record committee makes a decision on the provenance of a bird. It turns out that the smew is not likely hers, and those lists are safe. Here's the interview, thanks so much to Rosemary for agreeing to answer my questions! Birdist: How did you start raising exotic waterfowl? Rosemary: I started raising birds in 1983 when 3 call ducks came on our pond. An owl killed one the first night. Then my husband built a house for them and we put them in at night to protect them. In the summer we bought 2 female call ducks for them and then you know what happens then, we had over 100 baby ducks that year. Birdist: Can you tell me a little bit about your covered aviaries? Rosemary: We have the 2 largest covered aviaries in the world with over 6 acres of flying room for our birds to fly in. Birdist: Do you mark your birds in any way that could identify them apart from wild birds? Leg bands, maybe, or pinioning? Rosemary: We now close band all of our birds with numbers and GHWS on all of them. We used to pinion them but leg bands are much better and do not harm the birds. It is also better for identification. Birdist: How often to birds escape? Do you ever find them? Rosemary: We only had some birds escape when our lower aviary was destroyed by a flood in 2009, the worst day of my life. We found some of their bodies so some birds may be flying around free. Birdist: This past December a female Smew was seen near Whitby Harbor on Lake Ontario. It's a longshot, but could that bird have come from your sanctuary? Rosemary: The smew could be mine. Birdist: I'd like to keep asking about that bird. Birders sometimes come across out-of-place birds - like this smew - and don't know what to do. We only "count" wild birds, and sometimes smew get blown off course and show up over here. Other times they could have escaped from a place like yours. It's very rare that we get an actual answer, which is why it'd be great if we can try it here. Here are some pictures of the bird that was seen in Ontario. It's a young bird, and a female. As far as I can tell, no bands or other markings of captivity were noted. Do know if you were missing any birds like this around Mid-December 2011? Rosemary: What you have there is an immature male. Females never have white on the top of there heads or that much black around the beak. Here is a picture of a mature smew and a molting female. Sometimes smew will cross with a hooded merganzer and breeders will just get rid of them anywhere they can. I wasn't missing any smew at that time. Most small birds like this wouldn't last long with all the predators out there. Birdist: Not one of your birds, though, you think? Rosemary: I wish it was. I would love some wild blood here. If he looks lonely I have lots of females for him here. I do have some injured wild birds that couldn't make it in the wild, that have broken wings or were shot and almost died but she didn't so she is here. Birdist: Are there state registration or reporting requirements for your birds? Rosemary: Yes there are US Fish & Wildlife reports that have to be made every January where you have to count every bird, how many birds you raised, aquired, sold and died. You also have to apply every year for an endangered specie permit for the NeNe Geese and also a NY State DEC permit to raise waterfowl. Accurate records are a necessity. We are probably one of the only facilities in the world that Necropsies every bird that dies so that we know why they died. Records are kept of every death. Birdist: It's very interesting that you perform necropsies on your birds. What are the typical causes of death? Predators, disease? Rosemary: Most birds die from the same diseases as people. A lot from liver failure, kidney failure, viseral gout, heart disease and tumors. We used to have trouble with aspergillosis but my vet and I worked to develop a vacine for my eiders and now we have a completely resistant breed of Pacific Eiders. I collected 6 pacific Eider eggs in Alaska in 1990 with all the proper state and federal permits and now we have 100 healthy beautiful flying Eiders. They are absolutely beautiful and perfect. Birdist: It's good to hear that you follow all the regulations. I've spoken with finch breeders before who don't believe that everyone is as on-point as you are. Do you think there are other exotic waterfowl breeders or owners out there who aren't as careful as you are? How widespread do you think this is? Rosemary: Most people do not keep accurate records and really raise birds for resale. I follow all the laws and believe that if you are gived the privledge to do this job you should. We very rarely sell anything because I believe birds should be able to fly and be in as natural a setting as possible. Most breeders are like a zoo where the birds are kept in small enclosures and do not fly enough to keep their lungs clean. As a result most birds stay here forever. I have some birds 28 years old. Birdist: Who are your customers for these birds? Farms? People looking for cool pets? Rosemary: They are people who want to raise some exotic birds to resell and make some money. It is really impossible to make money on animals if you keep them right because their food is really expensive. they have to have a license for me to sell to them.